Dubai, UAE, November 06, 2018: Known for being one of the top environmentally responsible brands, The Body Shop has just launched a new Enchanted by Nature Christmas gift collection – inspired by winter forests, and wild life to enchant your senses with its most invigorating scents and textures. With 80% of the world population projected to live in urban areas by 2050 and million hectares of forests is predicted to disappear if no action was taken, The Body Shop is dedicating a percentage from every purchase of the Christmas collection to help protect and re-wild forests around the world. Also, in efforts to protect wild animals, The Body Shop is adopting the world’s bio-bridges approach – which aims to protect and re-wild over 75 million square habitat and bio-bridges by 2020. Bio-bridges help protect and regenerate corridors between rainforests, this will help link isolated and endangered animals and plant species and allow them to breed again. With these solid approaches in mind, The Body Shop believes that protecting forests and wild animals means they can continue to enchant future generations with their revitalising beauty and biodiversity. Olivia The Owl (AED 99): Meet Olivia the owl! This nocturnal critter is filled with six surprises and enriched with the fruity and creamy scents of strawberry and coconut. These will help refresh your bath and shower routine, as well as protect winter dry skin. Also, this fun and festive give transforms into a roly-poly money box after. What could be more festive than peppermint candy cane, Bon Bon and vanilla marshmallow body butters? Enriched with peppermint scent, cranberry seed oil extract and vanilla extract – this creamy trio of uplifting, fruity and sweet treats will keep the skin softer and smoother all season. 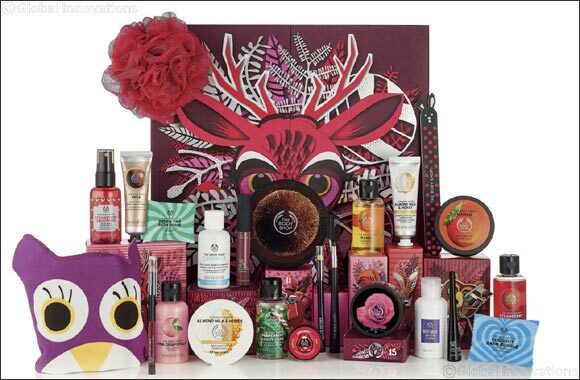 A global survey by The Body Shop showed that 1 out of 2 individuals want to receive personalised gifts! So, if you want to gift your loved ones something truly unique this Christmas, the 100% natural and reusable gift pouches from The Body Shop are your way to go. These are handcrafted by community trade partners and teddy exports from India. Simply choose your pouch, fill it with skin-loving treats and leave under the tree! Leave your skin feeling smooth and moisturised with rich African Ximenia Scrub and Japanese Camellia Body Cream. This luxurious duo relaxes body and mind in no time. Power up with this gloriously pink trio – zingy Pink Grapefruit Shower Gel, floral Rose Dewy Glow Face Mist and fruity Strawberry Bon Bon Shine Lip Liquid. The fluttering wings of this novelty gift have five zesty, zingy and uplifting balms to mix and match and keep lips soft, moisturised and protected. With vibrant packaging inspired by the luscious layers and thriving wildlife of the forest, the Deluxe and Ultimate Advent Calendars both pack 25 luxurious treats. With vibrant packaging inspired by the luscious layers and thriving wildlife of the forest, the Deluxe and Ultimate Advent Calendars both pack 25 luxurious treats. While the Deluxe includes a full-sized Body Butter and 4 make-up essentials, the Ultimate features 14 full-sized favourites, including the Drops of Youth™ Bouncy Sleeping Mask and Oils of Life™ Intensely Revitalising Cream. These calendars offer more than a season of skin-loving surprises. They also set a 25-day challenge with small, fun tasks to help you get out, rejuvenate in nature and make the world a wilder place. After, the treat boxes transform into a picture puzzle that reveals even more beautiful beasts roaming in this enchanted forest. 24 days of skin loving surprises (Owl) – AED 299 and content is worth AED496. 25 days of the Enchanted ultinate advent calendar (Fox) – AED 599 and content is worth 1,074. 25 days of the Enchanted deluxe advent calendar (Deer) – AED 399 and the content is worth AED 621. Come and discover more from the Enchanted by Nature Christmas gift collection available at all The Body Shop stores across GCC.